Carl Gustaf Ekeberg (1716-84) was Captain in the service of the Swedish East India Company between the years of 1742 until 1778 during which time he made ten voyages to India and China. He was the foremost of all Swedish China travelers of the 18th century. He was the person who to the great enthusiasm of Carl von Linneaus, for the first time brought live tea plants to Sweden in 1763. He was the fabulous Commander, during Jacob Wallenberg's voyage to China with the East Indiaman Finland 1769-71. "The great wave" which hit the Finland on their crossing of the North Sea almost costed him his life. (Painting by Haegg based on a drawing by Captain Ekeberg himself, below). Only a few years earlier he had barely survived the foundering of another Swedish East Indiaman. Most other people would have got the message and stayed at home after this. In 1773, he published his recollections from A Voyage to China 1770-71, originally written as letters to Mr. Wargentin, the secretary of the Swedish Academy of Science, of which Ekeberg became a member in 1776. His "Voyage to China", dedicated to Carl Fredrik Scheffer, was illustrated with copper etchings, engraved by the official engraver Olof Orre of the Swedish Academy of Science, after sketches drawn by Ekeberg. Some of the etchings were engraved by Ekeberg himself. These published pictures from Canton by Ekeberg, became the basic impetous for the Canton trade paintings, sold to the West for the next hundred years. In 1776, he published a personally drawn sea chart of the North Sea, dedicated to the Honorable Directors of the Swedish East India Company. Ekeberg was also the author of several publications where he expressed his admiration for the happy and industrious Chinese people. His information and enthusiasm therefore became a part of the thoughts who were to motivate the Swedish revolution of the King Gustaf III. From documents we know that Captain Ekeberg among friends was called Gustaf - the same as his father, and due to the 18th century Swedish way of shortening surnames, "Ekeberg" would have been written EB, why the initials GEB therefore would be the correct way of shortening "Gustaf Ekeberg". 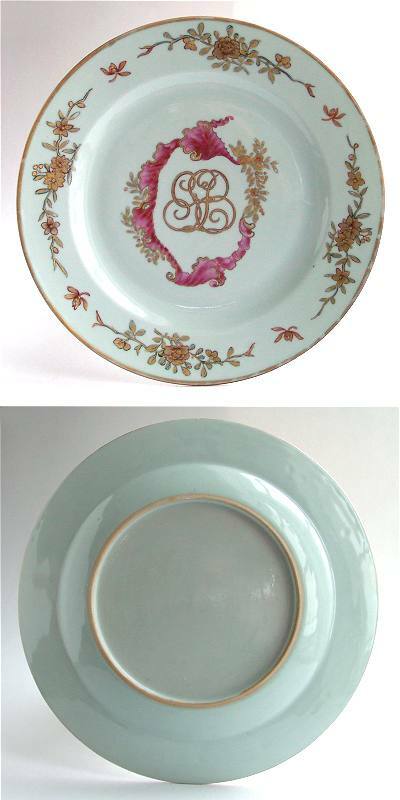 It is therefore possibly, but not certain, that this plate during any of his many voyages to China in-between the years 1750-70, could have been ordered by Captain Carl Gustaf Ekeberg. One possibility is that he did not ever order any porcelain with his initials during his travels or this is the most likely candidate - and only - to have appeared so far. One plate with this decoration is in the collection of the Museum of Far Eastern Antiquities in Stockholm. Decoration: Plate of Chinese export porcelain with rose pink Famille Rose, iron red and gilt enameled decoration in the rococo style of the mid 18th century. On the rim, there are four flowering branches in Chinese style. In the style of the early classicism the area within the flat rim, is left undecorated. In the enameled rose and gilt rococo-shield the initials GEB are found, which are the same as the ones occasionally used by the Swedish East India Captain Carl Gustaf Ekeberg. The shield is similar to the one used for the legend on the Sea chart drawn by Ekeberg and dedicated to the Directors of the Swedish East India Company in 1776, and on some of the legends of the illustrations in his Voyage to China 1770-71.